It gives me great pleasure to record my appreciation of the intense love for Indian architecture that has continuously inspired Mr. Sris Chaadra Cbatterjee to tour India and Greater India and. ultimately, to sacrifice his everything for its rescue from decay, if not extinction. For many years Mr. Chatterjee has been working singlehanded to arouse public sympathy in favour of our ancestral architecture. In his personal capacity he founded and maintained a modest School of Indian Architecture where experiments were carried on in respect of developing allied arts crafts and industry. Specimens of his works have been illustrated-in the monograph. In India, Europe and America, his efforts have been enthusiastically appreciated by leading architects and art academies. Indian Architecture has a r cord of unbroken development for thousands of years. But it has been neglected during the last two centuries. It has been treated as Museum treasure merely, as a dead subject for the student of history and culture to be acquainted with. It is our duty to make it living again, should we desire an honoured place in the Comity of Nations. 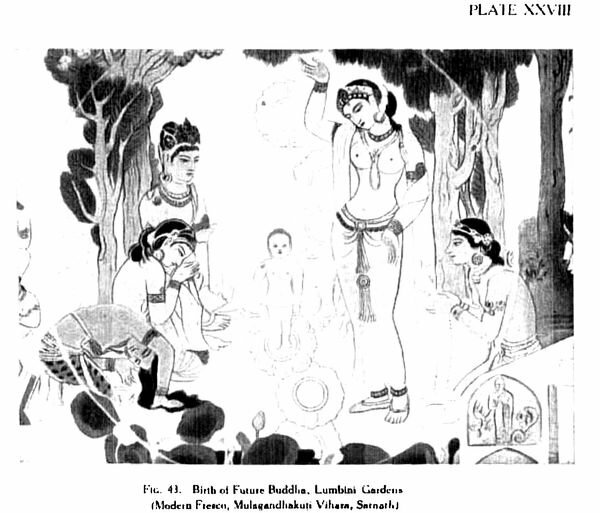 The purpose of this publication is not merely to repeat the historical events concerning Magadha, or reproduce with attractive: accounts some of its archaeological monuments, but to present before every cultured Indian multicoloured pictures of the glorious days of Magadha: how the people lived. what their ideals were, to what extent the spiritual belief and social demands of the nation influenced their town-planning and architecture] environments, and Above all, how in spite of limited resources at our disposal, due mainly to lack of state support, the healthy and artistic life of India which made the wonders of Rajagriha, Pataliputra and Nalanda Possible can be revived to some extent at least. I congratulate the author upon his imaginative faculty not inconsistent with the spirit of historical research. One cannot but admire his ability for a synthetic grasp of the entire life movement of a civilisation. Magadha is the cradle of a great civilisation. It fostered rival schools of philosophy, all of which contributed to the formation of a virile religion broadly termed Hindu. Architecture with allied arts originated and flowered in its creative soil. 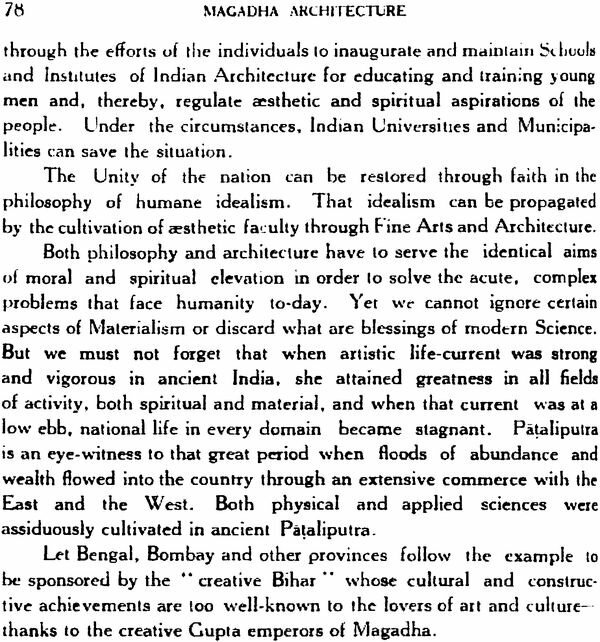 All the other phases of national activity and aspiration found distinct and eloquent expression in its historic capital Pataliputra which was nowhere surpassed by any of the existing capital-cities flourishing in the ancient world Religion, Art, Science, Literature and Engineering, all developed to a high degree of excellence. 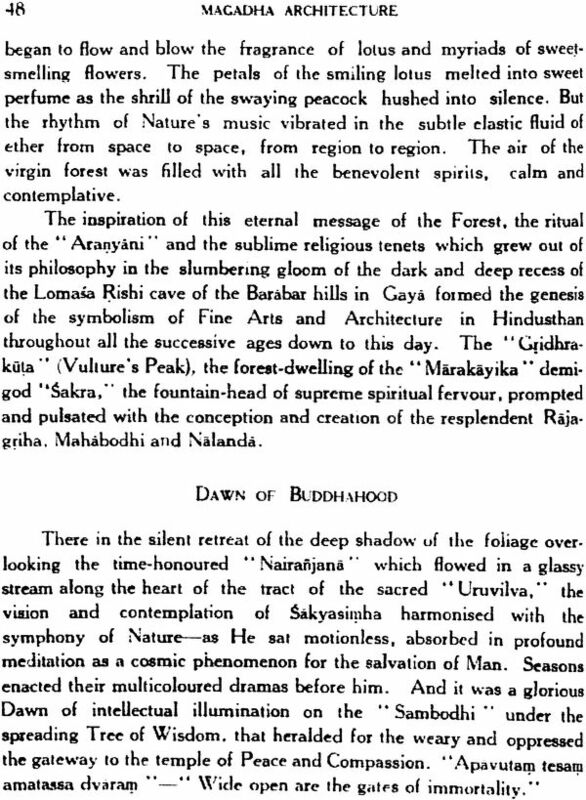 Currents and cross currents of spiritual thought and material prosperity flowed simultaneously to stimulate the creative energy of Magadha and lay the correct foundations of Indian Nationalism.<>p The achievements of Magadh, however, attained maximum height at the instance of the International Universities of Nalandas, Uddandapura and Vikramasila. For over six hundred years the monastic establishments ungrudgingly and impartially patronised all branches of Brahmanical and Buddhistic faiths and learning. Religion and Literature, Art and Music, even scientific studies of Medicine and Applied Chemistry, were zealously cultivated in well-equipped colleges and laboratories. History has witnessed how the life of the Indian nation began and ended in Magadha with the rise of Rajagriha and decline of Nalanda and Gauda. Refracted light from temple avenue of Nalanda illumined for a time several provincial organisations. But never again India could assemble on a strong cultural platform. The glory of Magadha is, however, imperishable. The traditions of Pataliputra and Nalanda will for all time to come enliven and inspire India and the World to live peacefully in a bond of love and compassion:- Magadha, the rise and fall of which constitutes the central and main event in the history of India's great past; Magadha, which has witnessed the rise of Buddhism, destined to become a great force in civilisation; Magadha, which produced Asoka, the most enlightened emperor who devoted the entire resources of a vast sub-continent to the moral and spiritual uplift of humanity and thereby carved out a unique place for Jambudvipa between the Orient and the Occident: Magadha, which under the Guptas and Palas reached reached the zenith of cultural development with much wider expansion, particularly in respect of a complete synthesis of Architecture and allied arts. Mr. Cgatterjee looks forward to the active co-operation of all lovers of Indian Art. He represents the spirit of Renaissance in Indian Architecture. It is in this light, and this alone, that his work should b judged and appreciated. As a worthy exponent of the spirit of Indian Architecture and Culture, may he not fail to interest seekers of Truth and Beauty, irrespective of race, creed or community. During my travels in most parts of India and portions of Greater India, I found distinct traces or remains of ancient and mediaeval Indian towns,-and I was invariably inspired by a vision of ancient India resplendent with Fortresses, palaces, residences, temples and gardens of the kings end people with all their artistic and healthy outlook. The eternal messages or Ajanra and Ellora, Mernalla-pnrarn and Conjeevaram. Dilwara and Vijaynagar excited my imagination and enchanted my soul. 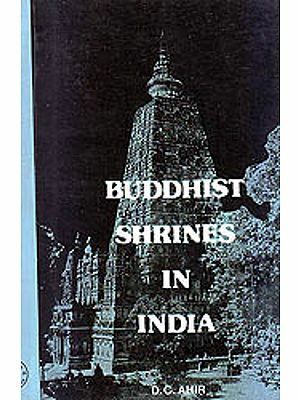 Ancient lndian literature including the Epics and the Puranas, publications on Hindu and Buddhistic philosophy, treatises on town-planning in ancient India and histories and illustrated monographs and memoirs on Indian fine arts and architecture revealed to me the intrinsic value of Indian civilisation. For years together I travelled and travelled in the quest of Beauty and Truth,-pondering over the glorious past of the sub-continent. And with the eyes of an inquisitive architect, reinforced by the knowledge I earned from library, I scrutinized numerous monuments of Indian architectural arts scattered over the beauty-spots of lndia. Alone l roamed in the dense. virgin. tropical evergreen forests of Burmo-Chinese frontiers, spending sleepless nights in the reak-leef- covered mud-buts of the jungle-people. I walked hundreds of miles in Kashmir valley, Kedernath plateau, Darjeeling gorges over the spreading sea-coasts of the Coromandel and the Malabar, in arid jaiselmer state in the very heart of the great desert named That, thorny Aravalli ranges of Mewar from Chitoregarh to Kumbhalgath, the antiquated expanse of the Indus valley, and in the sunny highlands of smiling Ceylon. My fanciful dream were stimulated by the wonders of Indian architectural creations nurtured in the lap of Nature. But what made the deepest impression on my happiest dreams was a colourful and ever-moving kaleidoscope of the well-organised and progressive, yet artistic, life of the people of pre-historic ages who settled in the fertile valleys of the mighty Ganges and the Son along the picturesque regions of the great empire of Magadha subsequently governed by Chandragupta and Asoka. The halo of the distant grandeur of the hoary Himalayan forests aroused in me the desire to lift myself up to the ennobled life as it was, when spiritual and artistic life-current was strong and vigorous in the India of Bimbisara. Asokaj Sarnudragupla and Vikramaditya Chandtagupta. It made me realise to the full l extent of my being the supreme spiritual atmosphere and mystic charm that created and stimulated for centuries and centuries the architectural arts and cultural expressions of Magadha. Actuated by the desire for entering into the creative spirit of Rajagriha, the capital of Magadha, in all its sublime ramifications, and in all its eloquent expressions, and for giving to the interested public some faithful idea of its unbroken development for 2.000 years, I have ventured to compile this little illustrated monograph on the architecture and culture of Magadha, the fountain-head of Indian arts, crafts and industry. I have tried to strengthen my argument with consistent, historical and archaeological evidence. The major portion of the monograph, concerned as it is with the science of archaeology and building engineering, is claimed as accurate. 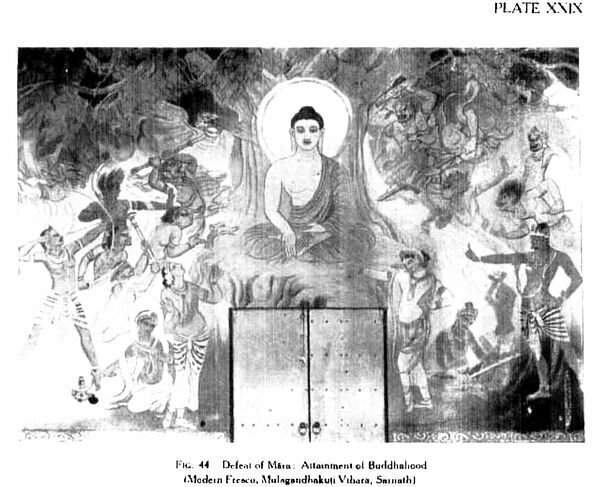 The portion on The Message of Magadha and The Dawn of Buddhahood is also claimed to be accurate. The portion preceding the conclusion explains in a nut-shell the irresistible influence of Nature in designing the classical architectures of the world, in an historical perspective. The concluding pages advocate the claims of the national architecture of India and suggest a constructive scheme for its resuscitation from threatened extinction. Only in the case of portraying the city of Rajagriha with a description of the social and civic life of the kings and peoples, I could not but strain my imagination to some extent. 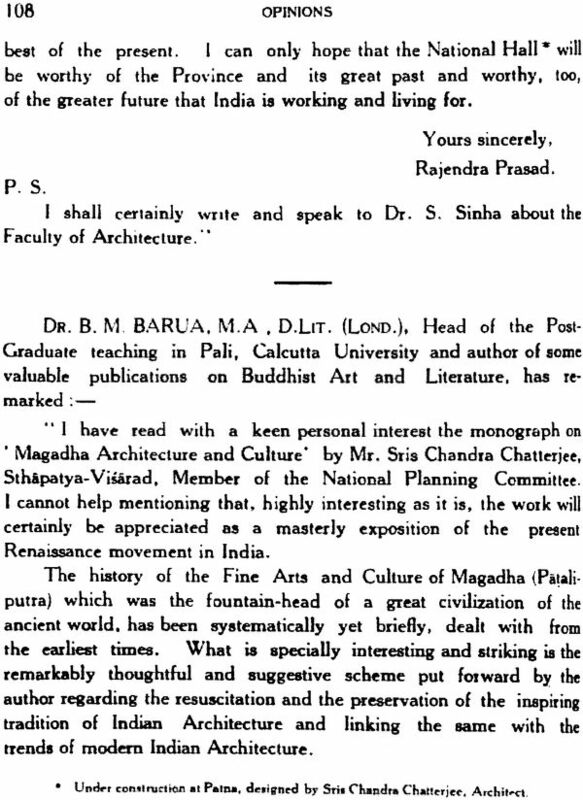 I am not a technical scholar, and the present monograph is not to be judged in the light of technical perfection, though I may say that I have spared no pains to utilize all available records, literary and Otherwise, that may be considered sufficient to produce a clear picture of Rajagriha and its people. Yet I feel that I should offer an explanation as to why I ha e linked up some confusing events and elements concerning different ages in the history of India, covering five or more centuries, in my attempt to portray the physical features and civic life of Rajagriha. Myargument is this: if the principles of planning the pre-historic cities of Mohen-jo-Daro, Harappa and Chanhu-Daro with their excellent arrangements for communication, water-supply, drainage and sanitation claim in certain respects similarity with those of modern Indian Towns, if the brick-joints facing the steps attached to the great Bath of Mohen-jo-Daro dearly indicate the principles of brick-laying in modern building construction with "EnglIsh Bond" in all its ingenuity. if the hidden stairway leading to the upper storey of the fortified residence of the feudal Rajput chieftain overlooking the shining-blue water of the Jayasamudra lake of Mewar recall the double-storied structure in Mohen-je-Daro with identical arrangement for staircase leading to the top floor, if the technique and icons of the Indus Valley seals and terracotta objects of art arc, though in develop d (onus. traceable in the ensembles of the Buddhistic and Gupta arts and crafts, if the 'saraswati-har ' (necklace) and bracelets of modem India look like some of the ornaments recently unearthed in the Indus Valley, if the pottery of India of 5,000 years back has remained almost unchanged in this country of to-day, if the modem method of pile-driving in weak soil, to withstand heavy load, is noted in Kmmabar excavation at Pataliputra below the massive compound wall of Asoka's palace, if the religious ceremonies and social affairs of the Hindus of 1.500 years ago in regard to foundation-laying. new-house-entering, and general planning of their houses, temples and 'dharemseles,' etc., concur fundamentally with our current rituals and social transactions to a considerable extent, if the marriage, 'sradh' and other ceremonies of the present Hindu are strictly based on the Vedic orders of performing religious ministrations, if the architectural form of the Borobudur stupa in Java could develop from that of Paharpur (Bengal), and certain items in planning the capital of Old Pagan (Upper Burma; Suvarna Bhumi) built by the king Pin Bya in the 9th century A.D. and the Thebaw's palace in Mandalay of the last century were more or less based on the traditional methods of town-planning of the Hindu monarchs, if the thoughtful designing of the magnificent city of Jaipur (Rajputana) followed the traditions of ancient Indian town-planning, and if the curious custom of tying a monkey to a post in a horses' stable with a belief to bring good health and good luck to horses. as it prevailed in identical manner in the resplendent Ujjain (Ujjayini) of 2.000 years back. 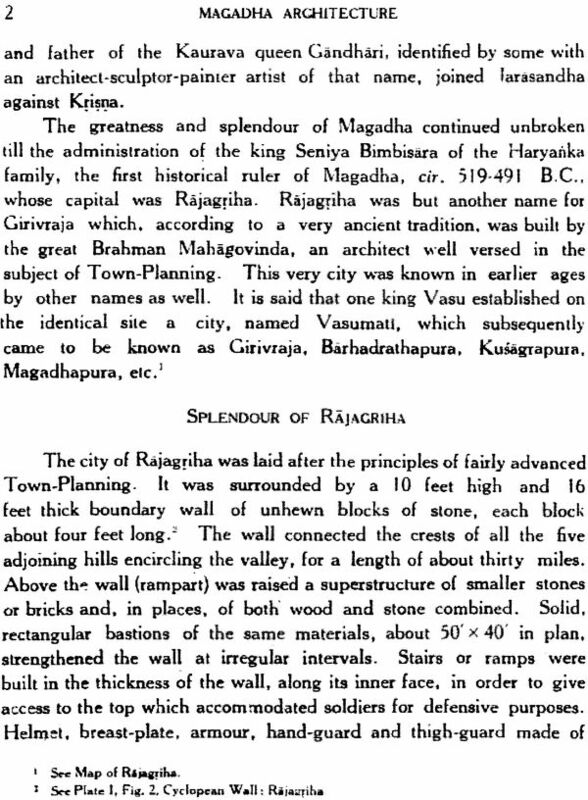 is still now followed in this land, then the principles of planning tile ancient Rajagriba of Bimbisara and the then prevalent manners and customs of the kings and people of Magadha were certainly adopted more or less in the time of Kautilya in respect of town-planning and social and ceremonial adjustments, and were subsequently followed by those in Buddhistic and Gupta ages. The ideals and aspirations of the "nagarnkas" of Rajagriha must have influenced the groups of citizens inhabiting different provinces of Magadha and neighbouring kingdoms, consistently with what were recorded in Sanskrit dramas and Pali literature. 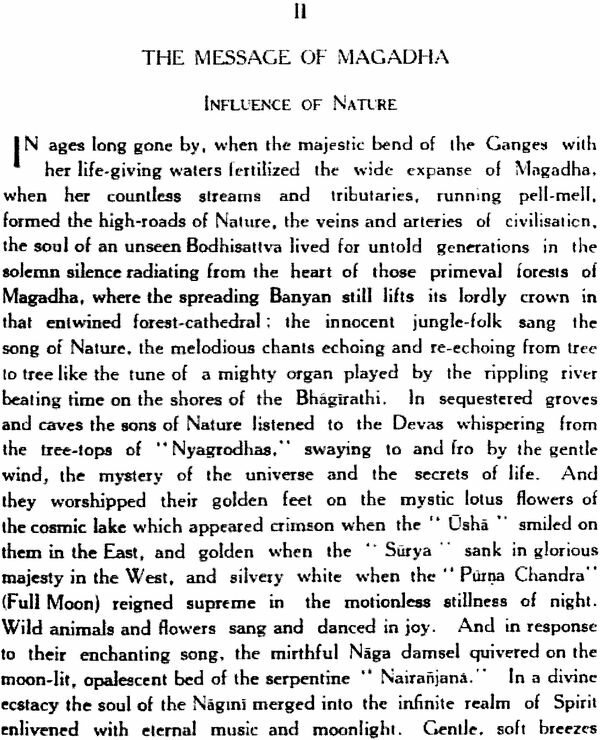 They were more so because the life-current of ancient India followed its course through long and comparatively straight channels, unsullied by extraneous influences, in sad contrast to what it has been subjected to at the present period of Indian life and outlook. My stay at Bikaner, as civil engineering officer, for a fairly long term, my researches in Udaipur where I Spent about six months, as a State guest, with all facilities for scrutinising the mediaeval Indian monuments as well as the present fairly unsophisticated life in Mewar, and my study of the palaces and towns in Jaiselmere, Kaiselmere, Indraprastha, Ujjayini, Vijayanagar, Mandalay, Pagan, Angkor Thom and elsewhere in India and Further India enabled me to pick up some idea about the plans and designs of ancient Indian towns and palaces, the traditions of which (as recorded in ancient literature regarding descriptions of the same) were more or less followed at Bikaner, Vijayanagar and Ujjain. Certain aspects of the social life prevailing in those places attracted my special attention. Those aspects, including the manners and customs maintained particularly by elderly ladies there, and the styles of some of their costumes, ornaments and household furniture, are traceable in Sanskrit, Pali and Tamil literature. 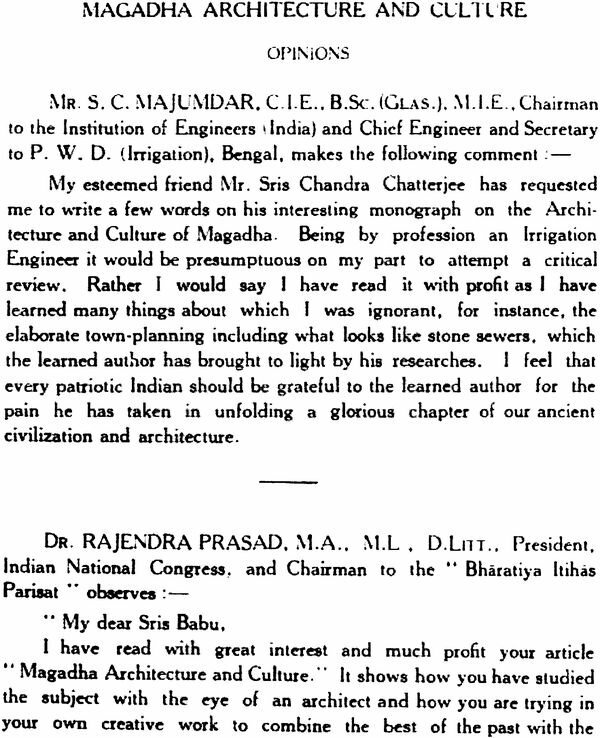 Lovers of Indian arts and culture should appreciate the very laudable attempt of Dr. Rajendra Prasad, President of the Indian National Congress, to revive the glories of Magadha in respect of architecture, and his active co-operation with the present writer with a view to beautifying and dignifying the city of Patna with a moral of a modern Indian structure in developed Gupta style of architecture, which is under construction, to be utilised as a Congress National Hall. Restoration of 'Building-Khaddar' which encompasses all kinds of indigenous architectural arts, crafts and industry all over India will secure employment for millions of workers-several times more than the number of weavers maintained by 'Khaddar' industry-remove economic distress in many ways to a considerable extent and rescue our finest cultural expression from strangulation. The period of the Indian Renaissance may be said to hay started with the contact of India with the West after the establishment of British Rule, Renaissance is not merely a simple revival of the past It is a re 'orientation of ancient ideals to new conditions. This kind of change has taken place in the different spheres of our cultural life-Religion, Philosophy, Literature, Fine Arts, etc. The names of Raja Ram Mohan Roy, Devendra Nath Tagore, Keshub Chunder Sen, Dayanand Seraswati, Rabindranath Tagore, Abanindranath Tegare and Gandhi occur to one's mind when one reflects on the vital changes through which this country has passed in recent times. It is However, unfortunate that a similar emphasis on our ancient ideal in the field of Architecture has not occurred to any adequate degree. 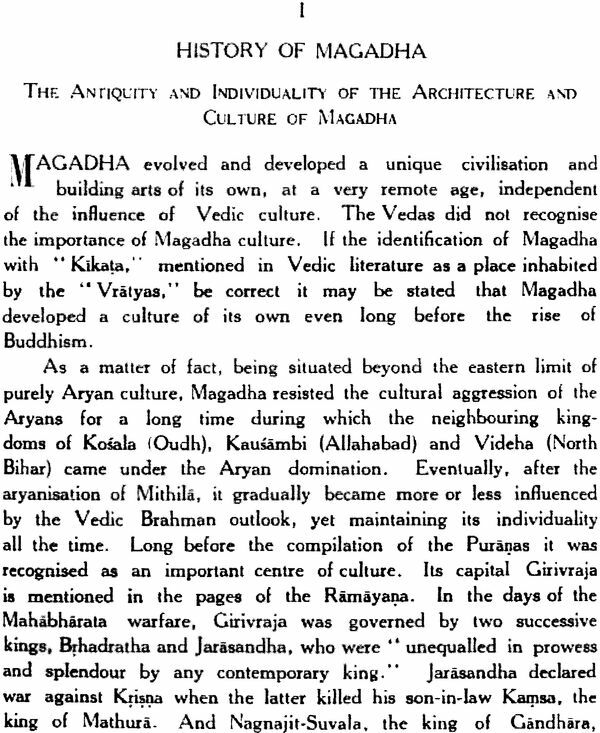 This book, Magadha Architecture and Culture by Mr. Sris Chandra Chattetjee. intends to bring about a judicious development of our Architectural science and save us from the wave of vulgarity which is on us at the moment. He gives a vivid and interesting Account of the glories of Magadha and rouses u to a consciousness of the great fall from those ancient days. If India's architecture is not sufficiently Indian, if it is a mixture of varying patterns, it is because our lives themselves are a patchwork. It is a common saying that humanity can be redeemed by beauty, and beauty in human life is possible only if our live are rooted in the depths of spirit. We are carried away by sense Impressions or logical ideas, but deeper than both these is the power of the soul, the artistic capacity located in each individual human being, if we live from the depths, our Jives will have grace and beauty. An attempt should be made to raise the general tone of society so that every boy and gill will have music in the voice rhythm in the gait and beauty in the limbs. The houses we dwell in are so much a part of our life that they reflect the high ideals we possess. If our ideals are low, our buildings will be dull and uninspiring; if our ideals are high, they will be impressive and elevating. Before we shape the body, the soul must be trained. This book is intended to convey to us an idea of our own ideas of architecture and impel us to put them into practice in our buildings. 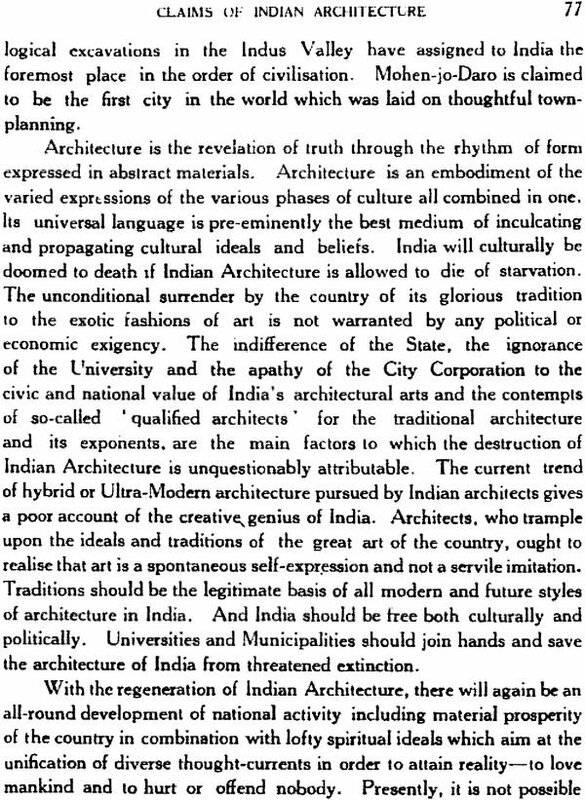 I am not competent to offer any reasoned and expert opinion on the subject of Indian Architecture. This, however, I can say without hesitation that Mr. Sris Chatterjee has given much time and thought to this subject. He is a lover of Indian art and architecture and is impelled by a noble desire to see the ancient designs adapted and accepted on a large scale. If his work succeeds in enlisting sympathy from those who are in a position to help it, it would have achieved its object.